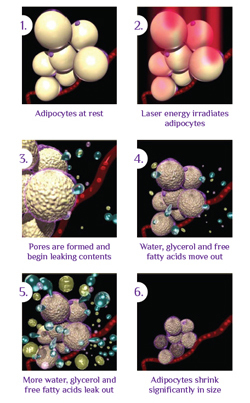 The Firmslim Lipo System is the first ever non-surgical procedure which combines with the use of oils. The unique user friendly handset combines infra-red laser, bipolar radio frequency and mechanical roller vacuum suction for assisted lymphatic drainage. The Firmslim Lipo System procedure combines four effective techniques in one. Laser therapy heats the skin, lowering its resistance and causing the fat cells to open. This releases fatty free acids, water and glycerol. Radio frequency energy then penetrates deeply into the tissue to lift and tighten the skin. The vacuum suction increases the diffusion of oxygen between cells and a cavitation effect is formed, resulting in a very powerful and effective treatment. The treatment boasts instant inch loss whilst banishing cellulite and reducing stretch marks. Fine lines and wrinkles are also effectively treated, particularly around the sensitive eye area, the jawline is instantly lifted and the skin is left toned and hydrated. As we age, the protein levels in the skin reduce significantly due to sun exposure and the stress of everyday life. The production of these proteins (collectively known as collagen) which maintains the skins integrity also slow down. As the amount of collagen in the skin decreases, the skin looses elasticity begins to sag, which leads to the face between the cheek bones and jawline drooping and wrinkles appearing. There are a number of reasons why we gain weight: mostly it is due to poor diet and lack of exercise, but it can be because of our metabolism and a poor digestive system. Toxicity occurs in the body from a damaged digestive system caused by eating the wrong foods, smoking and alcohol. This makes our bodies inefficient causing us to gain weight and hold on to fat and extra water underneath the subcutaneous layer which creates a build up of toxins.